Almost four decades later, the image can still make hairs rise on unsuspecting necks. It's 1968, and 200 meter gold medalist Tommie Smith stands next to bronze winner John Carlos, their raised black gloved fists smashing the sky on the medal stand in Mexico City. They were Trojan Horses of Rage -- bringing the Black revolution into that citadel of propriety and hypocrisy: the Olympic games. When people see that image, their eyes are drawn like magnets toward Smith and Carlos, standing in black socks, their heads bowed in controlled concentration. Less noticed is the silver medalist. He is hardly mentioned in official retrospectives, and people assume him to be a Forrest Gump-type figure, just another of those unwitting witnesses to history who always end up in the back of famous frames. Only the perceptive notice that this seemingly anonymous individual is wearing a rather large button emblazoned with the letters O-P-H-R, standing for the Olympic Project for Human Rights. Only those who see the film footage notice that he never throws a furtive glance back at fellow medal winners as they raise their fists. He never registers surprise or alarm. At a moment that epitomized the electric shock of rebellion, his gaze is cool, implacable, his back ramrod straight, a fellow soldier proud to stand with his brothers. Only those who go beyond official history will learn about the true motivations of all three of these men. They wanted the apartheid countries of South African and Rhodesia to be disallowed from the Olympics. They wanted more coaches of African descent. They wanted the world to know that their success did not mean racism was now a relic of history. The silver medalist with the white skin stood with Smith and Carlos on every question and it was agreed before the race, that if the three, as expected, were the ones on the dais, they would stand together: three young anti-racists standing together in struggle. of a down under blacklist. That silver medalist with the nerves of steel and thirst for justice was Australian runner Peter Norman. Norman died of a heart attack last week at the age of 64 and Monday was put to rest. 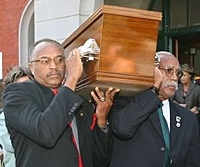 Two people who knew the depth and conviction of Norman's solidarity were the two who acted as lead pallbearers at his funeral: Tommie Smith and John Carlos. Over the years the three men had stayed connected, welded together by history and the firestorm they all faced when the cameras were turned off. The backlash endured by Smith and Carlos is well documented. Less known are Norman's own travails. He was a pariah in the Australian Olympic world, despite being a five-time national champion in the 200 meters. He desired to coach the highest levels, yet worked as a Physical Education teacher, the victim of a down under blacklist. As John Carlos said, "At least me and Tommie had each other when we came home. When Peter went home, he had to deal with a nation by himself. He never wavered, never denied that he was up there with us for a purpose and he never said 'I'm sorry' for his involvement. That's indicative of who the man was." When the 2000 Olympics came to Sydney, Norman was outrageously outcast from the festivities, still the invisible man. In a conversation at that time with sportswriter Mike Wise, Norman was absent of bitterness and wore his ostracism as proudly as that solidarity button from 1968. "I did the only thing I believed was right," he said to Wise. "I asked what they wanted me to do to help. I couldn't see why a black man wasn't allowed to drink out of the same water fountain or sit in the same bus or go to the same schools as a white guy. That was just social injustice that I couldn't do anything about from where I was, but I certainly abhorred it." deal with a nation by himself. of who the man was." Norman never strayed from a life of humility. When a sculpture was unveiled of Smith and Carlos last year in California, Norman was left off, the silver medal platform purposely vacant so others could stand in his place. Smith and Carlos protested it, feeling it fed the false idea of Norman as political bystander. But Norman himself who traveled from Australia to California for the unveiling said, "I love that idea. Anybody can get up there and stand up for something they believe in. I guess that just about says it all." Norman didn't define himself by self-promotion, book deals, or the lecture circuit -- only by the quiet pride that he was a part of a movement much bigger than himself. By happily surrendering his personal glory to the greater good, Norman earned the love and respect of his peers. As Carlos said about sudden passing of the man his children called Uncle Pete, "Peter was a piece of my life. When I got the call, it knocked the wind out of me. I was his brother. He was my brother. That's all you have to know."